The field of dentistry is concerned with the health and appearance of the oral cavity which includes the teeth, gums, and tongue, as well as with the jaw. The first occupation that typically comes to mind when we think of this branch of medicine is dentist, but other options might interest those who want to work in this field but aren't willing to, or can't, spend the significant time it takes to prepare for this career. If you want to help people preserve their oral health and appearance, you can become a dentist, dental hygienist, dental assistant or dental technician. Their roles and responsibilities of these dental careers differ significantly from one another, as do their educational and licensing requirements. Read through these brief descriptions and then dig further to learn more about them so you can decide which is the best fit for you. Dentists are health professionals who diagnose and treat problems with their patients' teeth and mouth tissue. They may be general practitioners or specialize in an area of dentistry like orthodontics, periodontics, endodontics or pediatric dentistry, and many own their own practices. If you want to specialize, you will have to spend another one to two years doing a residency in that area of concentration after you graduate from dental school. All states require a license to practice. You will have to pass Parts I and II of the National Board Dental Examinations. Their extensive responsibilities and training garnered general dentists a substantial median annual salary of $152,700 in 2015. Specialists earned more. 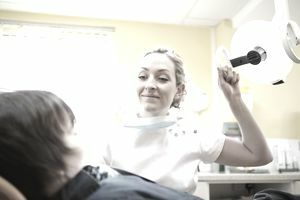 Dental hygienists and assistants, who both work alongside dentists, have significantly lower earnings, but that is proportional to their preparation and level of responsibility. Dental hygienists, generally working under the supervision of a dentist, provide preventative dental care. They typically spend a lot of time with their patients, performing cleanings, examining their mouths and teeth, and teaching them good oral hygiene practices. Their duties vary according to the rules of the state in which they practice. You must earn an associate degree from an accredited dental hygiene educational program if you want to work in this occupation. You will also need a state license. Requirements differ by state but always include passing an exam such as the National Board Dental Hygiene Examination (NBDHE). Although their compensation is significantly less than that of dentists, dental hygienists' salary is quite good. Their median annual earnings of $72,330 in 2015 make it one of the top 10 highest paying occupations that require only an associate degree. Dental assistants work alongside dentists, performing some patient care, but not the same tasks dental hygienists are licensed to carry out. Laboratory and office duties are also among their many responsibilities. In some states, those who want to become dental assistants must graduate from a one-year diploma or certificate program. Dental practices located in states that don't require formal education to provide on-the-job training. A license, registration or certification is compulsory in some states. Dental assistants earned a median salary of $35,980 in 2015. Dental technicians manufacture prosthetics and other appliances based on dentists' specifications. They are also called dental laboratory technicians. They do not perform direct patient care. Most dental technicians receive on-the-job training from laboratories that manufacture dental appliances. They begin their careers as helpers and are given more complex tasks as they gain experience. States do not license them, but they can get voluntary certification from the National Board for Certification, an independent board established by the National Association of Dental Laboratories (NADL). In 2015, dental technicians earned a median annual salary of $37,190. Employment and Training Administration, U.S. Department of Labor, O*NET Online, on the Internet at http://online.onetcenter.org/ (visited May 6, 2016).